Technique: Mold blown and free blown. Tooled. Classification: Isings (1957) form 71. Description: Transparent light aubergine coloured glass. Body first mold blown with ten ribs and then further free blown. Free blown cylindrical neck. Rim folded outward, upward and inward. Base flat, lightly pushed in upward. No pontil mark. Condition: Intact with iridescence and with some encrustation inside. 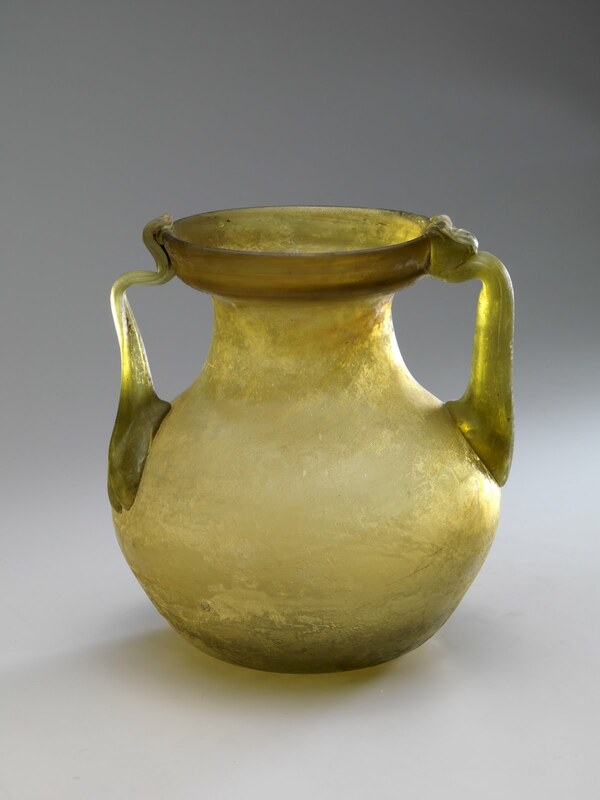 Remarks: In the 1st half of the 1st century AD coloured glass was strongly fashionable. 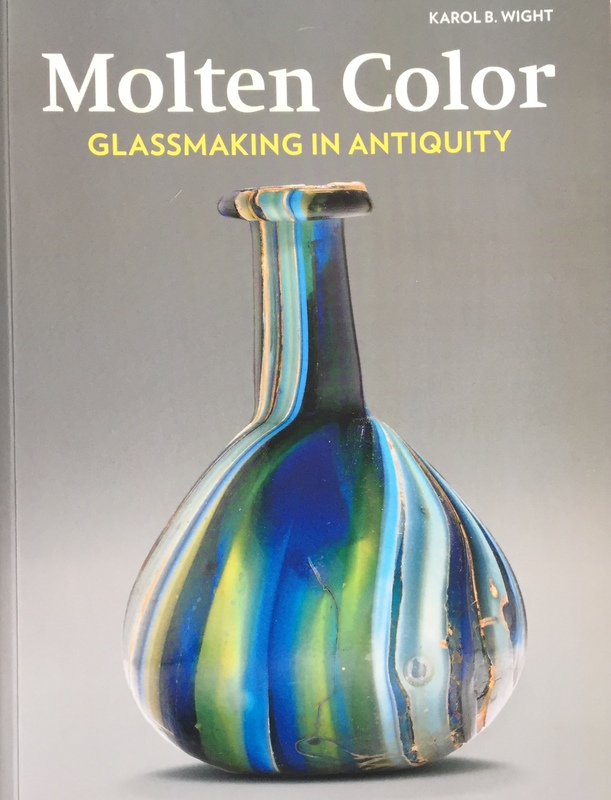 Later on in that century bluish-green glass was getting more popular. 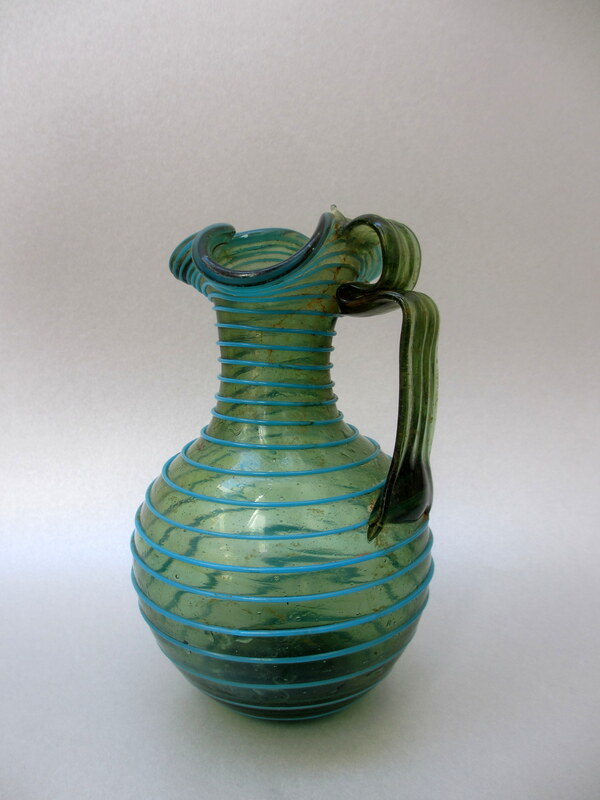 Bluish-green is the basic colour of Roman glass. This has been caused because sand (the main element for making raw glass) has been polluted by iron oxide. By addition of some percents manganese oxide in the raw glass the colour changed into aubergine / purple. Provenance: 2011 Atticard Ltd, London. Reference: Kunstwerke der Antike (Cahn Auktionen AG Basel), Auktion 7, 03-11-2012, no. 83 ( till 1986 in the private collection of P.M. Suter-Pongratz, Basel, no. 65). Isings (1957) writes about form 71 “Of this type only a few specimens are known, several of them found at Pompeii (Napels Museum)”. 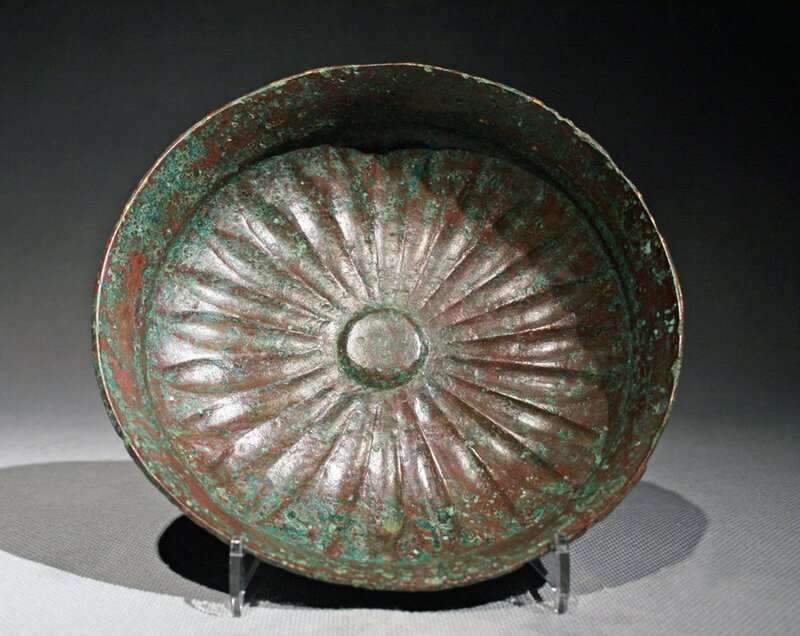 Origin: Most probably Syria ~ 4th century AD. Dimensions: H. 15,9 cm. ; ø rim 3,5 cm. ; ø foot 4,5 cm. ; largest ø ~ 5,2 cm. ; weight 62,9 gram. 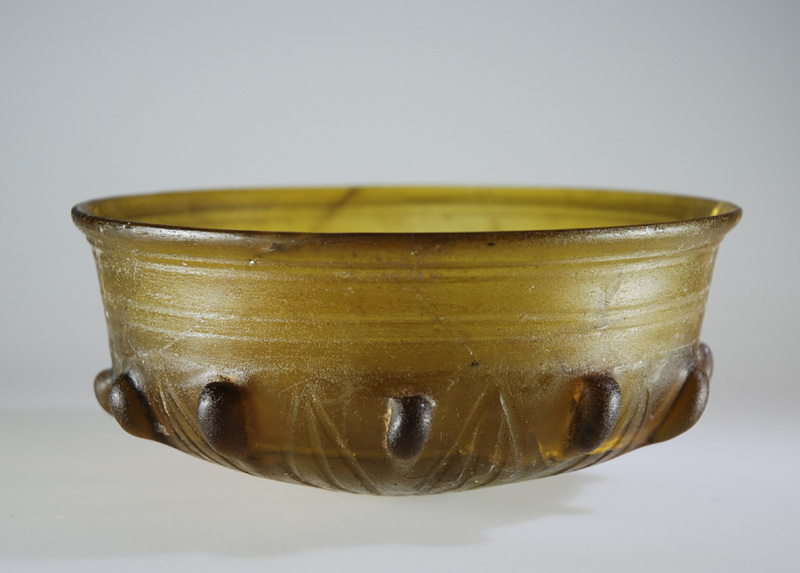 Description: The elegant piriform body of this yellow-greenish glass is set on a hollow foot formed from the same glass gathering as the body. 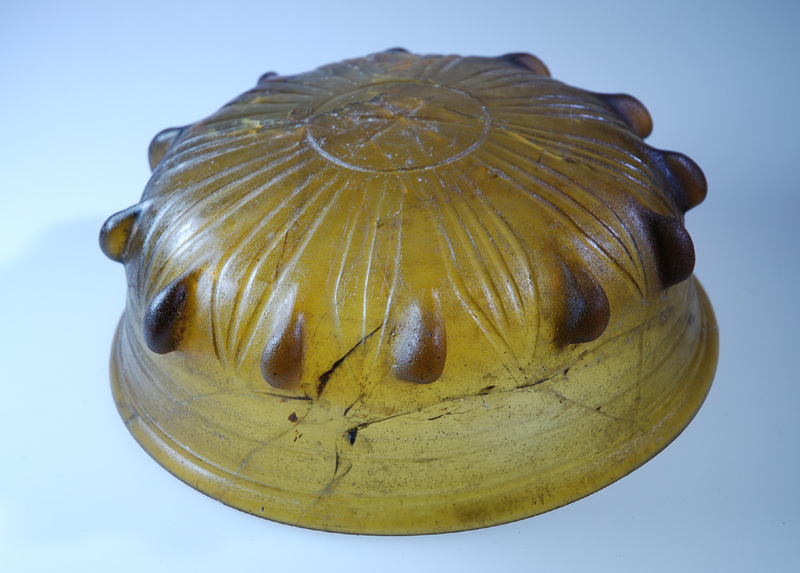 It is decorated with two handles made from blue glass with nipped extensions over the sides. At the top, the body narrows down to form a slightly tapered cylindrical neck with a flaring mouth being outward /inward folded rim. The pontil mark is quite visible. 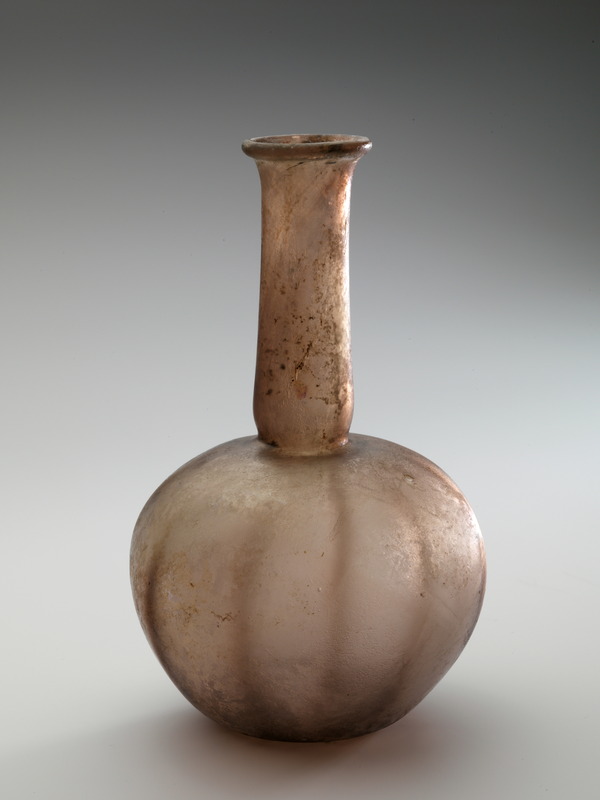 Remarks: These flasks are sometimes called amphorae, but I think that is extending the meaning of amphora a bit too far. As flasks of this type are quite often present in museums and collections these must have been quite popular in those days, but what did they store in those flasks? Presumably these were on the dressing tables filled with fragrant substances and not regular household items. Description: Transparent green glass with similar colored handle. Globular body; wide flaring trefoil mouth; rim rounded in flame, short cylindrical neck, ribbed handle with five broad ribs applied on shoulder, drawn up, making a loop and attached to back of rim. From base to rim of trefoil mouth a medium thick thread of turquoise glass, wound counterclockwise with approximately 27 revolutions. Mouth edge decorated with a coil of turquoise glass. 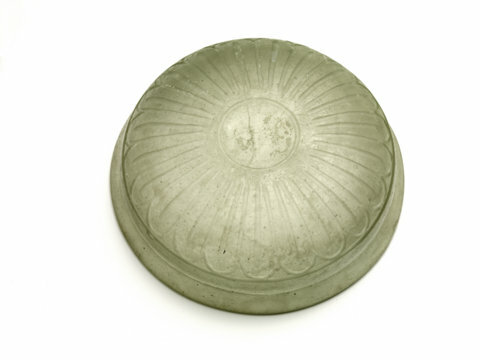 Flattened base, slightly indented. No rest of pontil. Exceptional rare, probably unique. Origin: Canosa, Apulia, Italy. Similar vessels were made also in Persia. Description: Four cut bands around the exterior rim of the vessel, 12 vertical petals in sunken relief cut into the exterior body with a single central cut rib in 10 of the petals and a pair each in the two remaining. A six point star cut into base is surrounded by cut band. 12 bosses of irregular size and spacing around the rim of the vessel. Whole of interior shows grinding marks and also on exterior rim and on the extreme base where the star cut is. Probable Technique: Slab of glass formed in a pancake shape and bosses formed and shaped before slumping over a former and reheating. Cut decoration made after cooling and annealing. Late 4th – early 3rd century BC. Rhodian. H = 3.7 cm. Dmax = 12.2 cm. Drim = 12.2 cm. Dbase = 3.2 cm. Weight = 188 gr. Triantafyllidis: Rhodian shallow phialai group B1. Crack over almost entire body but not broken and complete. Slight iridescence, surface well preserved. Cast and polished. Cut on both interior and exterior. Almost colorless transparent glass with slight greenish tinge. Thick walled (5 mm) shallow bowl. Outsplayed rim with rounded edge, flaring gently from almost straight sides. Wide horizontal groove (2 mm) on interior below rim, highlighting distinct carination between upper wall and rim. Slightly concave bottom encircled by a groove (1.5 mm), from where twenty one (21) elongated lanceolate petals with rounded ends radiate upward to the wall, where they are encircled by a pronounced horizontal groove that marks the junction of the lower wall and bottom. In the middle of each petal a median groove is cut. 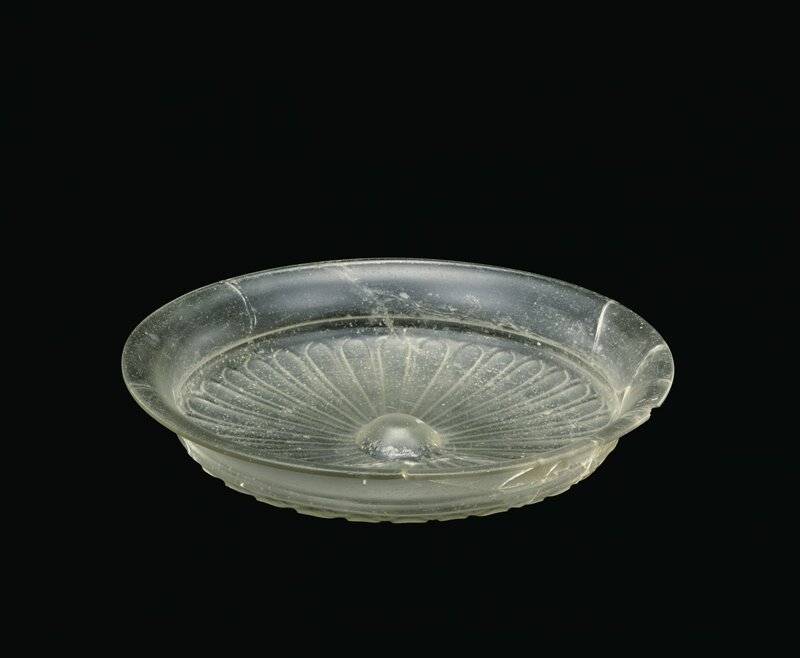 Shallow cast monochrome bowls with slightly carinated walls at the height of the shoulder and the base of the rim were produced in Rhodian glass workshops from the late 5th century until the third quarter of the 4th century BC (Triantafyllidis). 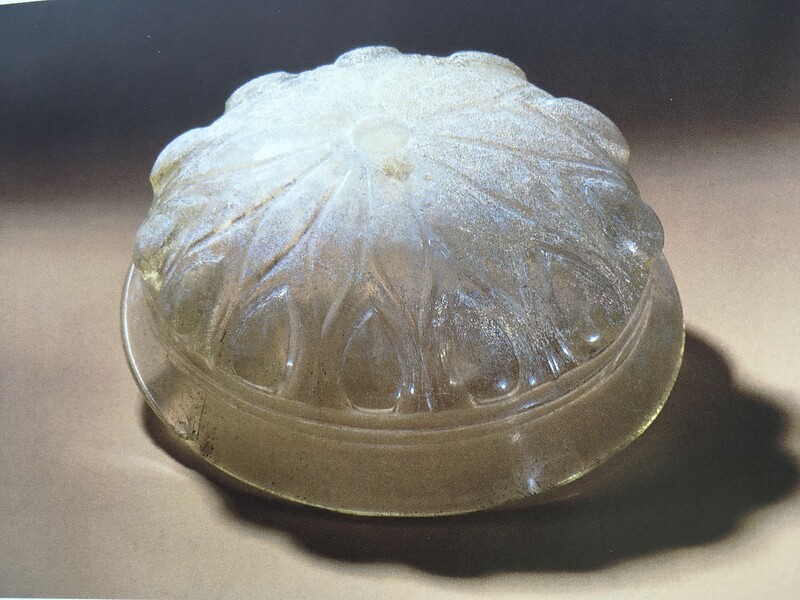 Glasswork from Rhodes in this period was influenced by glassworkers from Persia during the Achaemenid period (ca 550-330 BC) which makes it difficult to define the place of manufacture. 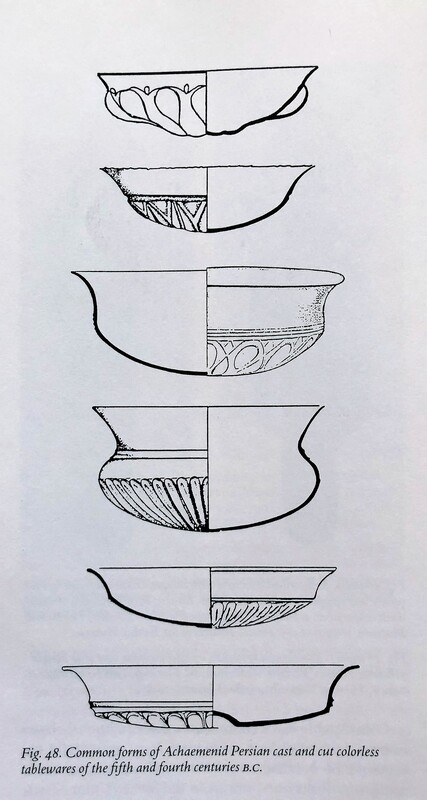 The color of the glass, the profile of the bowl and the cutting of the radiating petals are the primary reason for defining the date and place of manufacture of the bowl: Rhodian rather than Persian. Ex collection Joseph Uzan, Paris. Enchères Rive Gauche, 19-20 November 2012. Grose 1989, Toledo Museum, No. 34. 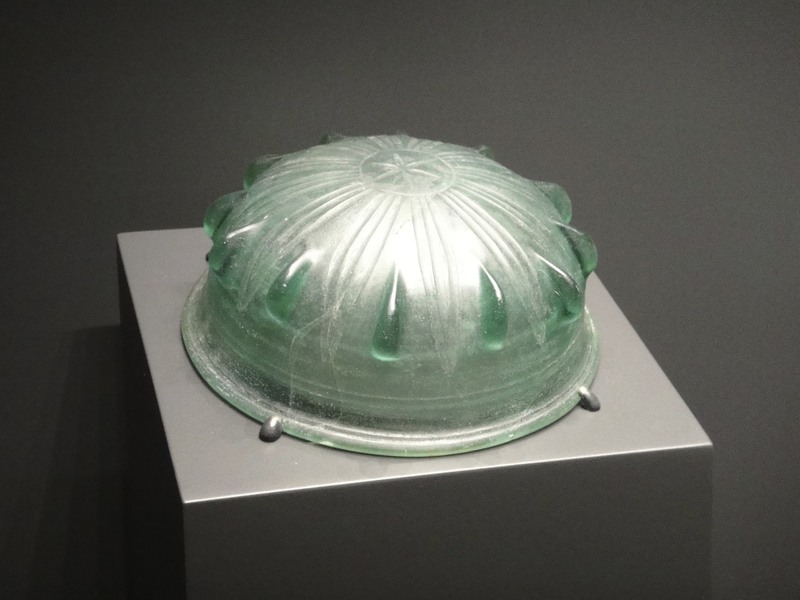 Goldstein 1979, Corning Museum, No. 248. 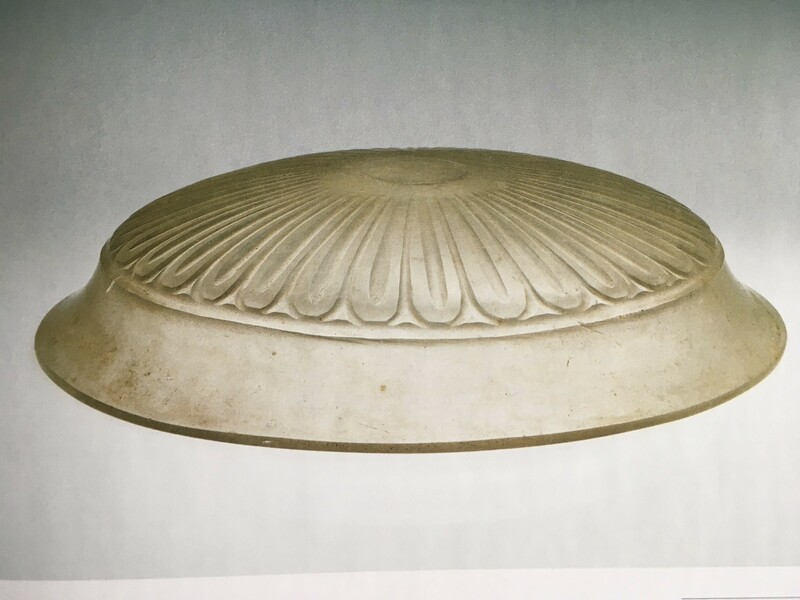 As one of the most versatile of all vessel shapes the bowl was probably the first to have been made by our earliest ancestors. 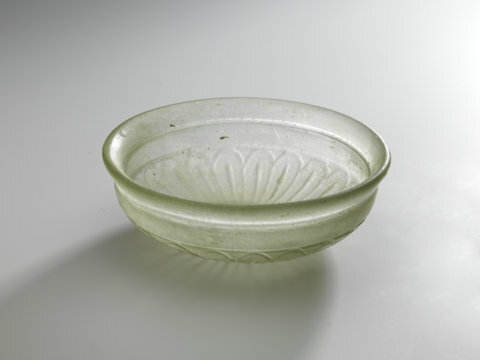 A bowl is common open-top container used in many cultures to serve food, drinks and for storing other items. 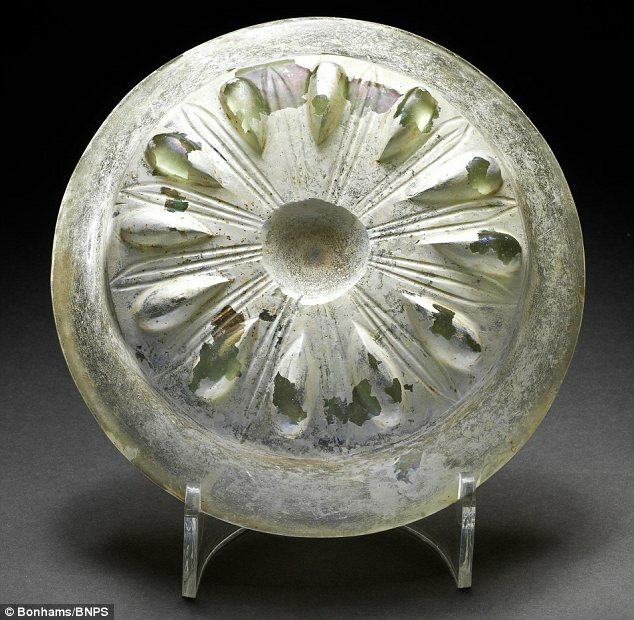 Although other materials such as stone, metal or wood were used to make bowls before and during the Roman period, once glass became popular around the 1st century glass bowls were manufactured in great abundance. 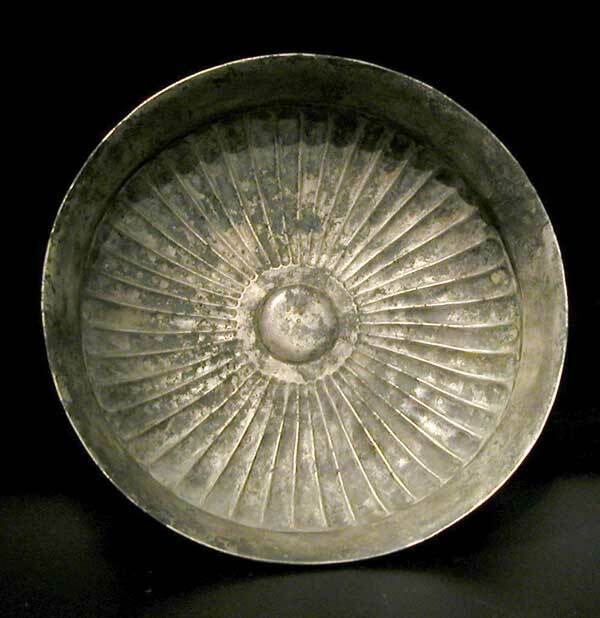 For additional information on any of the above Roman bowls look up the (R#) in the right hand side search bar. The search bar can also be use to find something on this blog. It is on the right hand column on the opening page. Depending on your device you have to scroll down to find it. If on your viewing device (phone) there is no right side column then switch to full view. 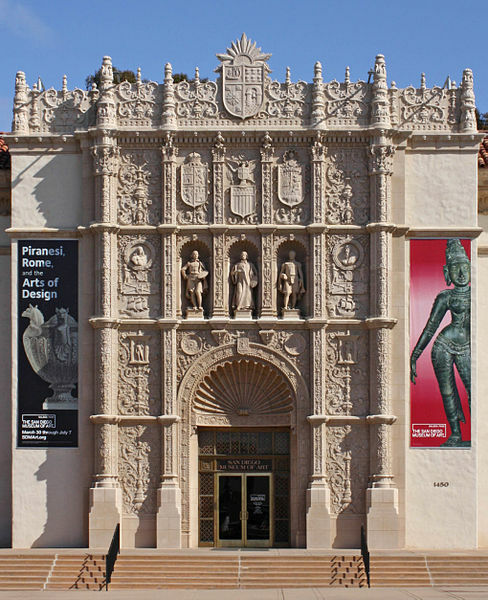 As the region’s oldest and largest art museum, the San Diego Museum of Art’s renowned holdings include a fine selection of European old masters, 19th and 20th century American art, an encyclopedic Asian collection, and growing collections of contemporary and Latin American art. 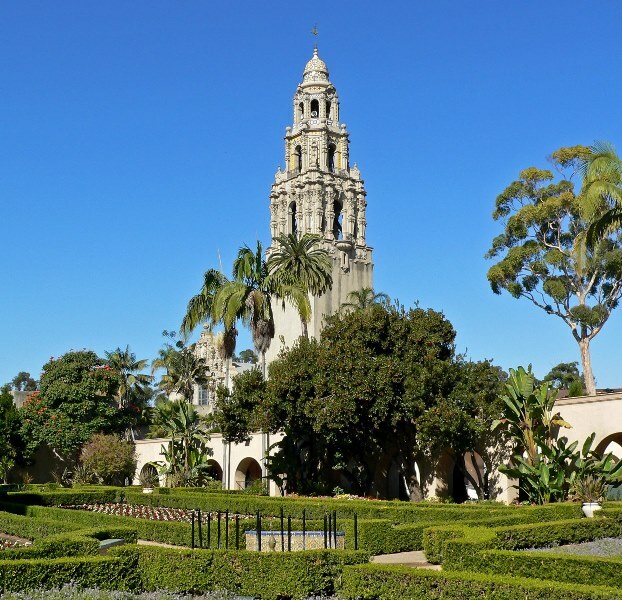 The San Diego Museum of Art is located in Balboa Park a 1,200 acre urban cultural park with museums, several theaters, walking paths, gardens and zoo in San Diego, California. The size of the glass collection is around 415 pieces from Europe, Asia and US. 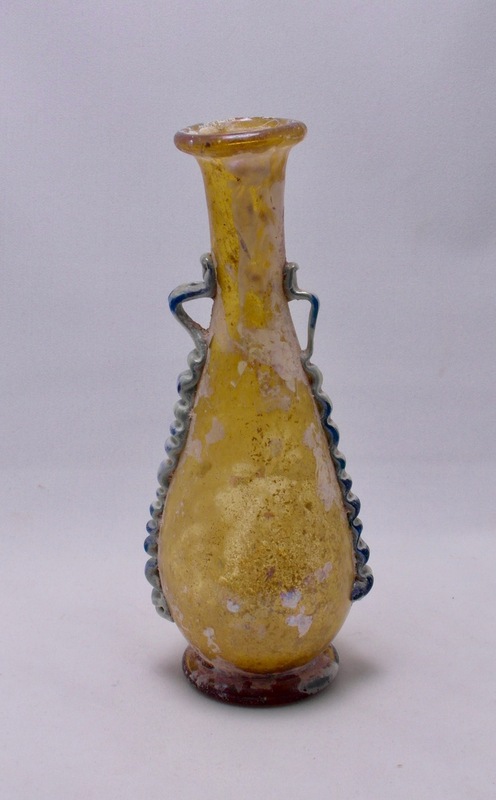 Below are examples of their Roman glass collection from the Charles P. Douglass collection given to the Museum in 1937.